Hot Towel Warmer - 18 litre, mid sized hot towel cabinet for Beauty. Equipment suitable for use in any Salon (Beauty, Barber, Massage), Spas, Restaurants and Medical. Hot Towel Cabinet - 18 litre capacity. (#CAPR018). Price: $335.00 incl GST. Add to cart. The capacity of this model is 18 litres. It comprises 2 separate shelves which can be removed. 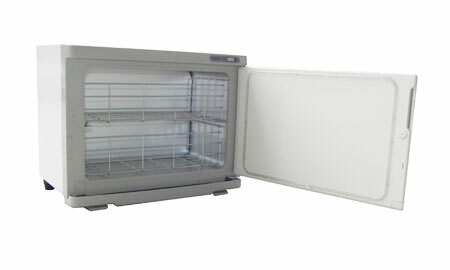 Maximum heating range is 70 to 80° C.
The drip tray at the base can be removed for cleaning. Door swings open from left to right. Power rating is 240 V, 50 Hz, 180 W.
Fitted with an Australian power connction. A 12 month manufacturer's warranty applies. External: 45 x 28.5 x 35 cm (L * W * H). Internal: 37 x 19.5 x 25 cm (L * W * H). Results are best achieved using small cloths such as Facial Towels. Unit works just as well of both wet and dry towels. ensuring that water is not dripping from them. Day Spa, Massage, Barber, Health Clinic, Cosmetic Surgery, Hotel, Funeral Home. Hot Towel Warmer Cabinets - CAPR018A . Door opens from top instead of side. You can buy this Hot Cabi and other Beauty equipment at Capital Salon Supplies. Online payments processed by PayPal. MasterCard and Visa are approved. Alternatively Internet Banking or Cheque are also accepted. We can be contacted on (02) 6162 1950 or email us. * Every available model can be viewed at our store in Canberra (ACT) during opening hours Monday through Saturday.